Big Pharma’s basic gameplay of processing raw ingredients into cures for various ailments has a substantially more puzzle-y bent to it than I was expecting at first. You start with a small, empty area of factory floor that has several import/export points in the walls. 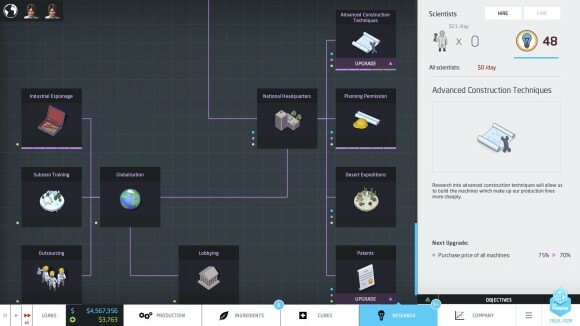 Clicking on one of these points brings up a dialogue that lets you import one ingredient from the list of discovered ingredients; each ingredient has four potential property slots (which can start out empty), and each raw ingredient is guaranteed to have a positive property that you want to sell to people — Soothes Cough, Removes Warts etc. — and at least one negative side-effect, such as Inducing Nausea. The ingredient/drug that you’re making has a single concentration value between 0 and 20, and each property in it is only going to be active in certain concentration ranges. Your job as CEO of this evil pharmaceutical conglomerate is to take this ingredient input and pass it through a nightmarish processing line of conveyor belts and machines that will maximise its positive effects while minimising (or even removing entirely) the negative ones. Once you’re happy with its properties you then convert it into a finished form (such as a pill) and export it for sale through another one of those import/export points. Each active positive effect adds to the value of the drug, and if you’ve tuned it so that the positive effects are at their maximum strength concentration you’ll get a bonus from the sale. Conversely, active side effects will impose a penalty to the value of your drug. As long as you balance things out so that the drug costs less money to make than it does to sell, though, it doesn’t really matter how many active side effects you have – it all comes down to that bottom line, in the end. This is where the catch is. Each step of the drug refinement process costs money; it costs money to first place the machine that’ll do it, and every ingredient you squeeze through that machine will then cost you more money. Take the most basic entry-level processing machines, the Evaporator and the Dissolver, which respectively increase and decrease drug concentration by one: each of these will cost ten bucks to process one ingredient – and remember, even the most basic starter drugs will require you to pass an ingredient through at least two or three of these. Add in the cost of importing the ingredient in the first place (about $35-$40) and the cost of converting it into a pill (a flat $20) and suddenly your profit margin on a drug that sells for $110 doesn’t seem all that great any more. It gets worse, though. Not only do your drugs have to make enough money to justify the cost of production, they also have to fund your researchers (who develop more advanced equipment that make processing of more valuable drug effects possible) and your explorers (who go out to find new ingredients that can be combined with your current ones to produce more powerful drug effects), and these are ruinously expensive at the start of the game. Each scientist costs $30 dollars per day to employ, each explorer costs $50 dollars per day to employ, and each piece of equipment/ingredient requires 2-4 of them to research/discover. 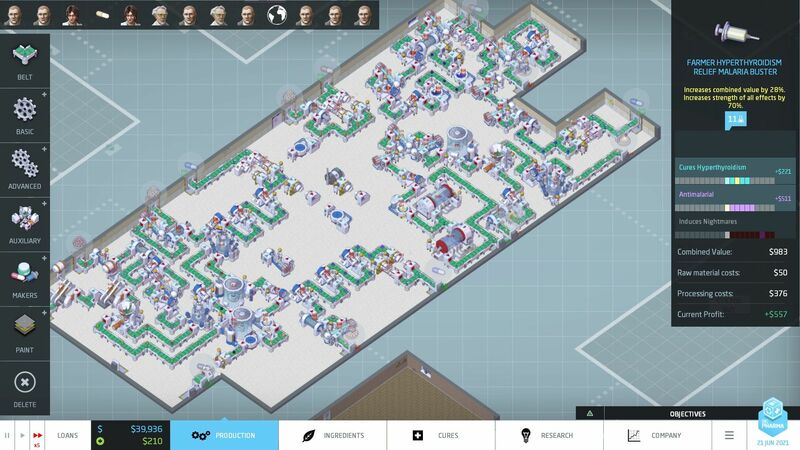 Combined with the tiny profit margins on the starting drugs, you can see why I spend the first half of each game of Big Pharma operating at an almost permanent loss with my company leveraged up to the hilt with every single loan that was available to me: you need the more advanced equipment and ingredients in order to build truly efficient, profitable production lines for your drugs, but the upfront cost of getting there is horrendous and staying afloat during the first few years is a genuine challenge. Why is getting more advanced equipment so important? Well, two reasons. The first is that positive properties in your drugs can be upgraded to better (and much more valuable) effects if you pass them through a certain piece of machinery while they’re at a certain concentration – but the equipment required is almost never the basic Evaporator or Dissolver; it’ll be one of the more powerful Tier 2 or 3 bits of kit, and *those* require you to invest money in research to develop. Negative effects can sometimes be removed in the same way. Each effect has at least two more tiers of upgrade – and some have three or even four — and each upgrade will usually require both a different piece of equipment and an adjustment in the concentration of the drug. 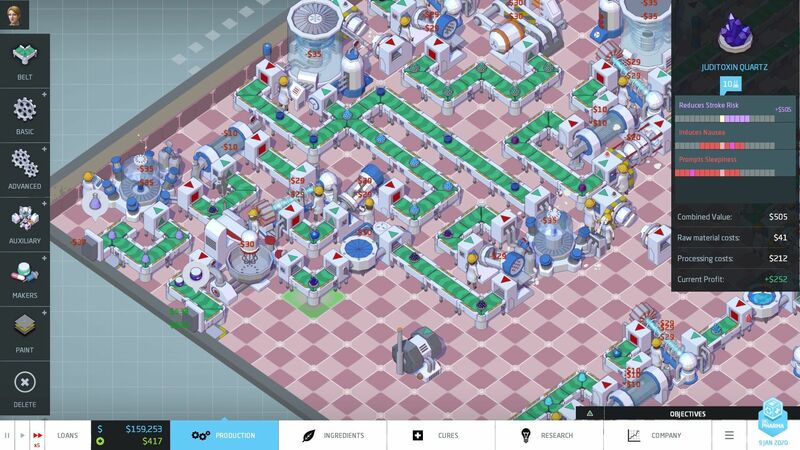 At a bare minimum you end up building a production line that’ll do something like: boost the concentration of a drug, upgrade it, lower the concentration, upgrade it again, lower the concentration even more, remove a negative side-effect, boost the concentration again, and then upgrade it one last time before you make it into a pill and export it. And that is for a lowly, mid-tier drug that requires no catalysts. The simplest way is to jam it through ten Evaporators at a total processing cost of $100. This would be incredibly wasteful in terms of factory floor space, which is usually at a premium when you’re trying to get 4-5 different production lines for different drugs to coexist in the same building. Or you could put it through three Agglomerators and one Evaporator at a total processing cost of $115. The Agglomerators are more expensive to run, but they’ll let you do this step using less than half of the space as the Evaporator-only solution would – and anyway, they’re often required for the drug upgrades. Finally, you can put it through one Agglomerator (boosting concentration to 8), one Cryogenic Condenser (doubling it to 16) and one Dissolver (reducing it by 1 to 15). This costs $95, and takes up even less space than the Agglomerator/Evaporator solution. So better tech doesn’t necessarily result in process savings, but it does at least let you fit more than one step of processing onto a single production line. The puzzle elements of putting a production line together are exacerbated by the fact that each machine has static input/output points for the drugs, and while you can rotate a machine when placing it you *cannot* mirror it – this means there’s a spatial element that comes to the fore, especially when you’re trying to get the line you’re building to coexist peacefully with the other production lines that are cranking out the drugs keeping your head just barely above water. The last element of drug production I should talk about are the catalysts. All of the level 3 effect upgrades and above require a catalyst in order to achieve; this is a drug effect (it can be positive or negative) with one of five catalyst symbols next to it. The catch here is that 90% of the time the catalyst effect is not going to be present in the same ingredient as the effect that you’re trying to upgrade, so you have to smoosh it together with one that does using a Mixer machine – and this is more complicated than it sounds thanks to the four effect slots per drug I mentioned earlier. When combining two different ingredients together one of them is designated the “base”, and any effects in the base ingredient will overwrite any effects in the secondary ingredient based on which slots they occupy. This means you have to get your catalyst effect in the secondary ingredient to occupy an “empty” slot in the base ingredient, which will require you to shuffle the effects around using a Shaker if it’s not in that slot by default – and if there are no empty effect slots in the base then you’ll have to try and remove one of the negative side-effects in order to make room. This all goes together to create a drug production process that is pleasingly complex – at least at first. There’s a good positive feedback loop going on – you sell drugs to research machines that let you make better drugs with a larger profit margin which let you research better machines etc. — and as previously mentioned, balancing the various demands on your financing in the opening thirty minutes of the game can be downright brutal. It forces you to cut your costs to the bone; I found myself selling defective Asthma medication that also Caused Breathing Difficulties (and no, I have no idea how the hell that works) simply because removing the side effect would have reduced my profit margin by an additional twenty dollars, which was unacceptable. It forces you to take every loan you can; it forces you to conduct mass layoffs of your staff if they’re not doing anything important; and most interestingly it forces you to maximise your short-term gain by saturating the market with drugs at the long-term cost of depressing the value of these drugs to the point where you’re no longer making a profit – hopefully by that point you’ll have used the money to develop something new and move on from that particular piece of scorched earth. For the first hour or so, Big Pharma works wonderfully well. And then it kind of falls to pieces. This is partly a problem endemic to a lot of strategy games, in that there comes a tipping point where you’ve broken the back of whatever scenario you’re playing and actually playing it to victory is just a matter of box ticking and end-turn clicking. It’s particularly bad in Big Pharma’s case because while there are AI companies in the game they have no real direct influence on how you play; their indirect influence is restricted to also putting drugs into the global supply – and they never seemed to affect the market the way I did — and occasionally patenting one of the shittier basic drugs so you can’t sell it (there’s like a million ways to get around this though). Mostly you are struggling solely against that bottom line, which means that once you finally stabilise to the point where you can fund your ongoing research while maintaining a consistent surplus income the challenge evaporates and you can coast to the end of each scenario at 5x speed. Thanks to certain boneheaded decisions Big Pharma makes about its endgame balancing this point arrives about two hours earlier than it really should (for context a single game of Big Pharma takes about four hours). 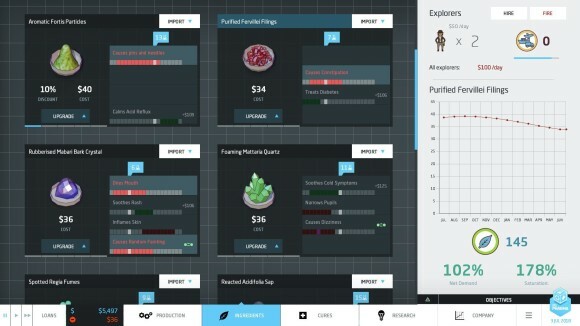 The financial struggle was a fine challenge for that first hour, but after the ninety minute mark you’ll be in a position to easily make Tier 4 and even Tier 5 drugs without too much trouble, and the profit margin on having a single Tier 4 drug effect at max strength is something like $300-$400. This is A Lot Of Money in Big Pharma, especially when you’re selling three of them at once. I don’t have a problem with their mechanical complexity, but they should have been, at most, about half as valuable as they actually were – enough to give me some breathing room, but not enough to allow me to research the endgame machines quite as easily as I did. Ah yes, those endgame machines. They’re right at the end of the research tree and even if you’re well off financially they still take about a year to research (a typical Big Pharma scenario lasts about 15-20 years), but they are thoroughly gamebreaking. The Large Hadron Collider activates every single effect present in a drug at once, effectively ignoring concentration requirements; this can be a double-edged sword when there are negative side-effects present, but the benefit of having two or more positive effects activated at once generally outweighs any penalty from the side-effects. However, the real Ivan Danko of Big Pharma is the Sequencer; this allows you to *pick* which concentration you want a drug to be at instead of having to incrementally increase/decrease the concentration using other equipment, which trivalises the drug upgrade process. These are both interesting and powerful effects for machines to have, but the problem with them is that they are so cheap. The Sequencer in particular can be upgraded so that its processing cost is comparable to an Agglomerator, making using it a no-brainer. This overgenerous balancing completely scuppers any long-term challenge Big Pharma might have had. It has a difficulty curve that terminates abruptly into a plateau just as it starts to get interesting; the game has mechanical space for some very complicated drugs – combining several Tier 4 effects into one pill is something that’s eluded me so far — but you’re never compelled or even incentivised to attempt them as you’ll make more than enough money selling Male Contraceptives. This makes the existence of the Sequencer and the Hadron Collider even more baffling, as the drugs that would appear to require such powerful machines are completely redundant unless you’re going for a high score; if you’re just gunning for scenario completion then all they do is trivialise the production of basic drugs from the moment you unlock them. 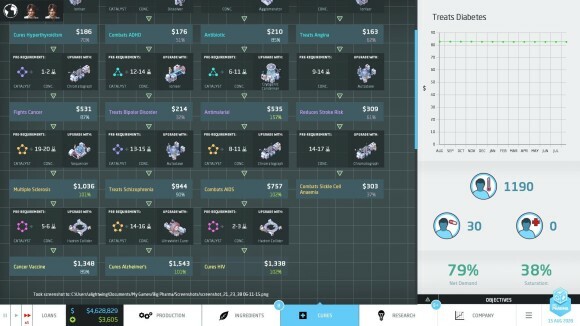 About those scenarios: Big Pharma doesn’t have a single player campaign as such, opting instead for a selection of open-ended scenarios with different starting conditions and objectives – one scenario asks you to make five million dollars by a certain date, another asks you to ship a certain number of a specific type of pill and so on. All of the scenarios are unlocked by default, but I feel that there’s nowhere near enough variety to make them interesting as the win conditions are all things that you’d end up doing anyway in the course of playing the game, meaning that once you’ve played one scenario of Big Pharma you have in effect played them all. Getting my head around the the way the ingredient effects worked took a little bit of time, but once I grasped it I managed to finish the three scenarios I played with every piece of research unlocked, every ingredient discovered and the target revenue score/pill total hit a good five years before the deadline. Two of them I completed at Expert level and one of them I even managed Master on. 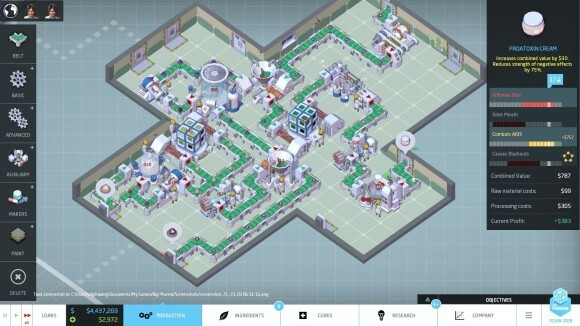 For a game that is so delightfully brutal during the first 60-90 minutes Big Pharma is paradoxically too damn easy; its AI corporations might as well not exist, its endgame economy practically throws money at you, and any puzzling moments the actual drug-refinement process might have presented you with are undone by the Sequencer. Its basic mechanics are pretty well thought-out and I got a good twelve hours of entertainment out of it, so I’m certainly not going to call it a waste of time. However its long-term potential is practically nil. This actually sounds like a great game. It is, for about twelve hours. I really enjoyed the way it played around with effects and concentrations – or rather, that it made *me* play around with effects and concentrations. That’s partly why I’m so disappointed, though, since those drug-construction mechanics are so good that Big Pharma had a lot of potential that I felt was squandered in the metagame. Just a head’s up, but the developer abandoned his previous game, Gratuitous Space Battles 2 after it failed to meet up to sales expectations. I’m worried that the developer will do the same for this game. I think that it is one of those games that needs a lot of balancing issues.